In the early days, new Twitter users were given an avatar that looked like a businessman walking along; later, it got changed to a bird, and since 2010 it's been an egg. Now Twitter is updating the default avatar again to something much more generic. Twitter gives three reasons for the change: to bring the default avatar into line with its recent rebranding efforts, to encourage users to actually get around to personalizing their profile, and to get away from the negative connotations that accounts with egg pictures have drawn in recent years. "We’ve noticed patterns of behavior with accounts that are created only to harass others - often they don’t take the time to personalize their accounts," notes Twitter. "This has created an association between the default egg profile photo and negative behavior, which isn’t fair to people who are still new to Twitter and haven’t yet personalized their profile photo." Originally chosen for being "playful, fun, and unique", the era of the egg avatar is over, Twitter says. The new picture has been chosen to emphasize that it's supposed to be a temporary placeholder, without suggesting any particular gender. The colors will make the default avatars less prominent in timelines, according to the designers behind the new look, but the contrast is high enough for those with visual impairments to be able to identify it. A number of other designs that made the shortlist have been posted on the Twitter blog. 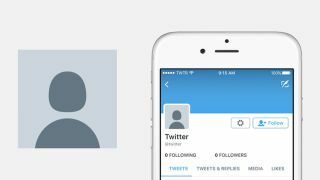 Twitter says it hopes the new default profile photo "encourages more people to express themselves" rather than sticking with the placeholder picture. Meanwhile, the social network is rolling out plenty of other features to help stop harassment.